I used to always do these for my deviantArt page, where I’d go over my various works and accomplishments. And in the last few days, I’ve been thinking a lot about this year. Thinking about how different a place I’m in now. Season 4 was probably the best season of Babylon 5. You had the Earth Civil War and the end of the Shadow War. So much happened in that one year of storytelling. But what really stood out to me was the opening titles. That…is a very effective description of the last year. You know, save for the whole 2261 and Babylon 5 bit. 2014 started with me on short-term disability from severe panic attacks in relation to…conflicts…with the Apple Store I was with at the time. Though I returned to work shortly after my birthday, the panic attacks resumed within two weeks. It was then when I realized that Apple–or at least that Apple Store–wasn’t the place for me anymore. As I searched elsewhere for an escape from the madness and depression, things became apparent to me. That there were those who sought to see me gone from my position I had fought so hard to earn. I saw the “writing on the wall” as it where. It was during a conversation where I saw these motions in play when I received a voicemail that changed everything. You see, a week or so before, I had interviewed for a position with Blizzard Entertainment. That was within a few weeks of me applying. This was after several phone interviews, all of which I simply called out of work for. Even in the midst of pain, fear and mental agony, everything changed. And a week later, I went outside to take a phone call on my last break of the day. During that phone call, I was offered the chance at a dream. A chance I never thought would actually happen. A chance to work for Blizzard Entertainment. It was that day when I put in my two-week notice at Apple. It was the end of my history with Apple. After a fashion. I was sad to leave my friends. I was not sad to leave that store. I still hope for the people who remain…but even before my departure, many long-time employees had fled that store. I still have friends at that store…but they are few and far between. I have no intention of ever walking in there again. Because the suffering my family endured at the hands of that Apple Store wasn’t over. However, at the beginning of June, I got to walk onto Blizzard Campus for the second time. The first time was for my in-person interview. The second time…it was as an employee of Blizzard Entertainment. The things I’ve seen there…they still take my breath away. Even six months later (can you believe it’s already been that long? ), I still make sure to drive by Building 1, with the huge “Blizzard Entertainment” logo in blue letters stand proudly at the top of the third floor. And I’m happy to say that in my time at Blizzard, I have completely rewritten the book on how they handle–ironically–Mac computers. I’ve said many times that I’m no Apple-head. I don’t think everything Apple does is perfect. I’ve endured too much to have any such illusions. But what I’ve accomplished there in six months has had a bigger impact than my entire time at Apple Retail. Sadly, the suffering wasn’t over. In the months after my departure, my wife was subjected to cruelty, cowardice and mistreatment. They refused to accept her new schedule since I now had a job with regular hours. Instead of simply saying goodbye, they strung her along for six weeks before suddenly, one Saturday, terminating her for “attendance violation” because they forced her into a position where she would be required to call out, despite her constantly trying to get her shifts covered and notifying them well in advance. That was a hard blow to us. Thankfully, through multiple miracles, we were granted unemployment despite Apple’s “claims” on how Laura had left the company. And so, God gave us enough to survive even with my new pay at Blizzard. And I prospered at Blizzard. Laura herself has said many times that though it is a little harder on us with me there, she’s far more happy that I am happy. That’s what really matters. While things haven’t always been easy, I have to say…I do truly love my new job. And as I go into the new year, things look even brighter. It was the year of rebirth… the year of great sadness… the year of pain…and the year of joy. Yes, while the information above can very easily be handled by those words, other things did happen. Such as during December, both of my daughters had seizures within a few days of each other. We did three separate ER visits. Two overnight stays in the hospital. One fully battery of neurological exams including CTs and MRIs. I ended up watching each girl by myself for at least a day and a half each. And it happened the week before Christmas. It was also the week when Blizzard had all their special Christmas events, save for the actual company Christmas party. I remember when I called out on Wednesday because Caitlyn now had had a seizure…thinking that this was the most ridiculous excuse ever. Like calling for your sixth “grandmother’s funeral” in Discworld terms (If you’ve reach the City Watch books, you’ll get it). In addition, the panic attacks haven’t really stopped. I thought changing jobs would help. And while that has helped, I’ve found that there is much more happening behind the scenes. I don’t pretend to understand it at all. At the moment, I’m just struggling through. On rebirth though…I usually don’t like another year passing. It’s a reminder of everything I want to do but haven’t yet. Did you know that I had planned to have two novels published by now? Why didn’t this happen? Blizzard. And that’s okay. Blizzard changed everything for me. In fact, I’m going into my next birthday happy…looking forward to what the years ahead have in store for me at Blizzard. It was a new age. It was the end of history. My writing? Well, I managed to knock out another NaNoWriMo, making this my fifth year running for winning the 50K race. This time it was a close one. 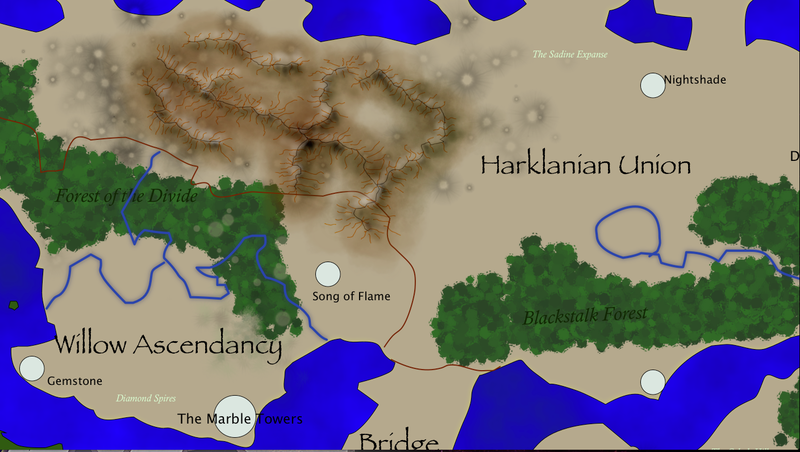 And I finally rewrote Stormhaven, a project I’ve been meaning to do for years. I’m fairly happy with the outcome too. In addition, I’ve published my second short story: “Beyond the Waterfall.” You should go check it out. Like right now. And if you could leave a review, it’d make my day. I published that back in September, though it was ready in July or so. There’s a process you have to go through when publishing fictional works now that I work for Blizzard. Oh well, it’s a small price to pay for working there. I’ve recently started writing again. I took most of December off, as I’ll admit I was swept up into World of Warcraft: Warlords of Draenor. Makes sense since my name is in the freaking credits now! My name should also be in the credits for the “Goblins vs. Gnomes” Hearthstone Expansion, but I haven’t actually looked that one up yet. But I have to say…seeing my name in the credits for World of Warcraft is a mind-blowing experience, especially since our subscriber base went from 7 million to 10 million within about a week of the launch. People like it. A lot. In other words, WoW isn’t going anywhere anytime soon. Anyway, a little obsessive about that game. Heh. And that’s my “new age.” An age where I can finally be doing something that’s going to affect millions of players across the world. I’ve found bugs in places no one’s thought to look. Remember those Panderan Phoenix mounts you got from the Silver Challenge Mode Dungeons in Mists? Well, during August or so, I discovered a rather surprising bug that they weren’t going account-wide as was initially posted in a blog post. It was just something someone overlooked and that stuff happens. Let’s be honest…within a few minutes of people logging into WoD for the first time, people would have noticed. But I stopped that from happening. I got it in and even got some praise by the Dev saying “Good catch.” (I’m not revealing anything here. It’s actually buried in the patch notes somewhere). It’s totally awesome to see your work in the classic “Blue Text” of patch notes. The funny thing is that’s not actually my job! It’s not my job to find bugs in the game itself. I’m supposed to handle the hardware side. But since I play this game every day the same way I’ve played it for years even after starting at Blizzard, I’m coming in with a unique perspective. I read the quests. I explore the details. I look around. There’s a lot of players who just hit “accept” the moment the quest pops up. I don’t. I’m emotionally attached to the characters. (And let’s just say that when I finally get in Creative Development, the Alliance is going to have their day (okay, I’m totally kidding, it would be years before I could do anything like that, but it’s a fun fantasy)). I play. And that’s gotten me a lot of cool things. Otherwise, we now have two kids. That was the same as last year, but Tali’s now yammering away in her own speech, though she can say Mama, Dada and Yay. I love this. She danced to the Opening Intro of My Little Pony. Heh. Caitlyn was raised on Mass Effect and Tali’s going to be raised on My Little Pony. I’m okay with this. But that brings about another change. I’ve said a dozen times that one of the reasons I threw myself into the Brony fandom is not only because of the amazing community, but because I realized I was afraid of what people might think if I decided to like this show. And that ticked me off. Anyway, I was utterly shocked to find that there wasn’t one! After some internal debate, I decided “Screw it! I’ll start one!” For months, I was the only one in the group, because I had no way to advertise. Then someone in HR decided to do the old Summer Rush idea (you know, when all the college clubs would come out and have booths so people could sign up?). Well, I knew I would be the only one there, but I did it. I had my Build-a-Bear plushies, along with my vinyls, PMVs playing on my laptop and a signup sheet and a raffle with prizes I purchased myself. And I got eleven people. 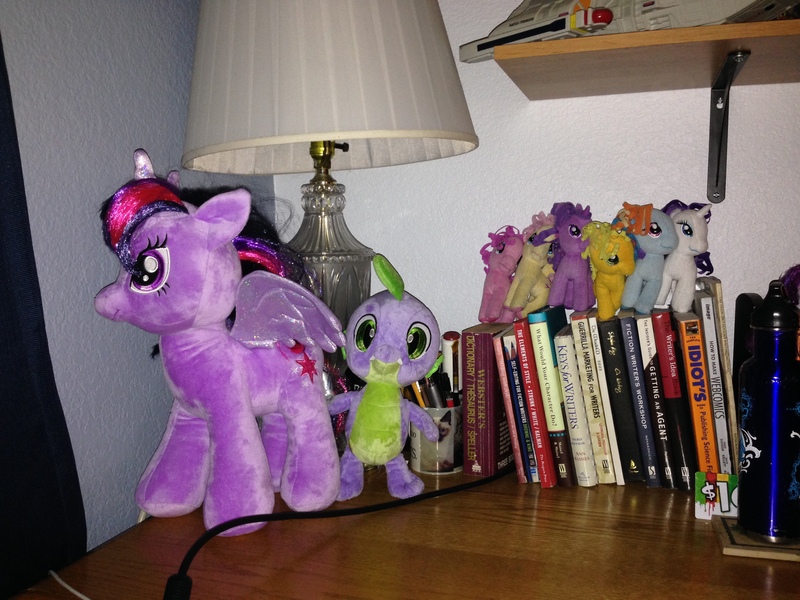 Since then, my desk has become a tourist attraction for anybody who likes Ponies. (I have about a bajillion of them decorating my desk, screensaver and walls) A lot of the people are parents like me who got into it because of their daughters. Some of them are original Bronies, who just checked it out probably because the internet was flooded with them. But no matter what, it’s a good group now. There’s still some misunderstanding about the Brony sensation, but I’ve made it my mission to make sure people get it. They don’t have to like the show, but I want them to understand the purpose behind this culture and that it’s not weird or creepy. I’m never going to convince everyone, but who knows? Maybe I can get a full “Elements of Harmony” quest line into the next WoW expansion. Heh. That would be awesome. My total is 364, which (according to the website) means I’m way above the normal line of stress. Heh. I could have told you that. Anyway, it’s just a random website I pulled up. But a lot of these events were one time events. The key is that we survived. Laura and I have been through more than you can possibly believe. Things that I will not be sharing with you all, but know that since we managed to survive them before we had kids, it made us all the stronger. While we will probably always have the occasional fight, miscommunication, broken expectation or issue, both of us know that neither of us is walking. Everything has changed. But instead of changing for the worse…or seeing the slow decline of my life into mediocrity, boredom and self-doubt, I can actually see a bright future ahead for the first time in a very long time. The war with Apple is over. Laura and I are both done. We passed through it, battered, cracked and scarred, but we passed through it alive. And now, we have a whole new life to look forward to. I think it’s only fitting that in the last few days, I’ve started a new story. You see, I’ve had trouble sleeping this last week (I got Christmas Eve-New Years Day as paid vacation) because of intense dreams. And I remembered something…that happens when I haven’t written. Someone who isn’t affected by the nightmares. And what this individual has the ability to do will change the entire course of human history…and human society. Anyway, this has been my year in review. So there’s only one thing to do so I can end it properly. I’ve done two major events for the Blizzard Bronies. A Double Feature starring “Double Rainboom” and “A Brony Tale” and Hearth’s Warming Eve with “Snowdrop,” “Children of the Night” and a couple other things. And I’ve found the perfect finale that I’ll be using for every Blizzard Bronies Featured Event. “House of Ponies” by Racercarghost. And then I just realized something. It’s actually not New Year’s Eve. It’s New Year’s Day. So I can’t “end” this. I need to “start” this. So there’s only one thing for it. I know there are a great many people out there who take New Year’s as a chance to go out, get drunk and party…thereby preventing themselves from having any memory of the night’s events. As you may have guessed by now, I’m not that kind of person. Instead, I’d like to take a look back…and take a look forward. I’m sure you had no idea that’s what I was going to do this time, right? No, stop looking at the title. There’s nothing there. I said stop. Since this blog is supposedly about me as a writer, that should come first, right? Well, let’s start with the biggest accomplishment: I’m finally published. 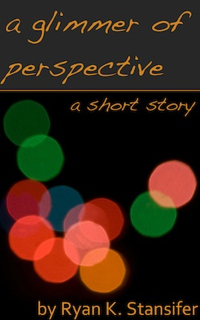 “A Glimmer of Perspective” was released on Amazon Kindle on September 6, 2013. For the first 90 days or so, I sold it at $0.99 and it did fairly well. A total of five reviews, with four five-stars and one four-star. A short time later, I published it on Nook, KOBO and iBooks using the Draft2Digital platform. I’m not saying that it was a huge success. It wasn’t really. In fact, I’m still not sure how to promote it. In September, I sold 11 copies of the book on Amazon. In October, I sold 2 copies. In November, I sold 1 copy. In December, I told 2 copies. In all that time, I only sold a single copy through the Nook, KOBO and iBook Channels. In truth, I have a lot to learn about the process, especially about promoting my books. But at least I can say that I’m out there. This was a huge first step for me and I don’t think I should let myself feel marginalized just because I wasn’t an immediate smash hit. This project was supposed to originally be a short story that ballooned into a small novella I managed to finish the day before National Novel Writing Month Started. Perfect timing too. Set in a previously-unseen area of Taylin (The Scribe/Dreamscape universe), it was the story of a boy with the obsession of wanting to fly like his beloved sun eagle…but never being able to find the right kind of book to help him Change into a bird. When the chance to get access to a book that might just give him that power coincides with his first date at an impromptu festival, which will he choose? I started it on October 11, 2013 and ended on October 30, 2013 at 12:01PM. The story clocked at 28,491 words. I’m not quite sure what to do with this story, to be honest. Maybe one day it’ll go in an Omnibus. But it’s another story with more of the rules started. Another great writing accomplishment for this year: winning National Novel Writing Month, even with having a second baby on October 31, 2013. I’m still not quite sure how I did it, but I did it. 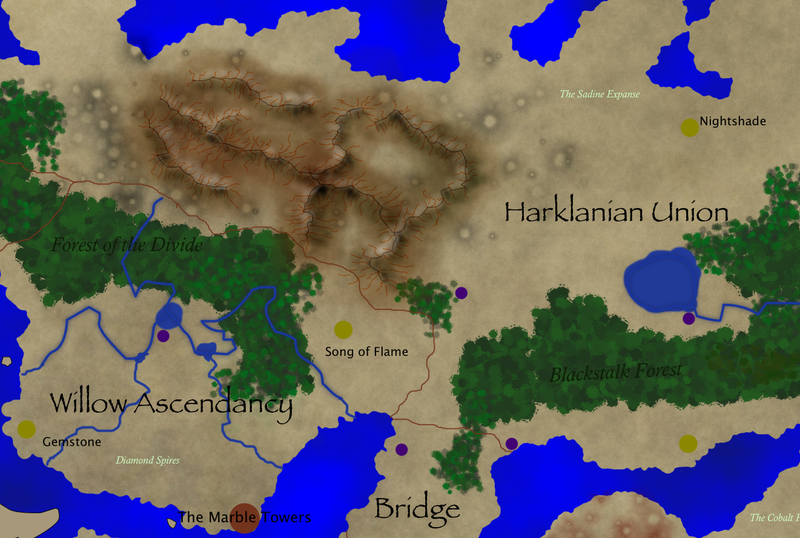 And this one finally gets my hero cast out of Rosan City to see the various fantastical locations all across Taylin. At the moment, our heroes are under attack by strange flying contraptions, pinned down by technology they’ve never even seen before. And that was after getting blown out of the sky (literally) as an elevator shaft was destroyed around them. They’re having a rough day, to say the least. Anyway, while I won’t be able to get to this tonight, I’m looking forward to getting to it tomorrow. I haven’t been writing in it the last few days because I’ve been as sick as a darn dog. The second of the Taylin stories, this mammoth beast was originally my National Novel Writing Month story for 2012. In the end, it became nearly 175,000 words. I’m not quite sure what to do with it, but right now, I’m still nailing down the general universe. But I think I might be reading too much Brandon Sanderson. My novels are too darn long most of the time. Anyway, I was happy to finally finish this on March 14, 2013. It needs an immense amount of work before I’ll let anyone even see it, but there’ potential there. I should also mention that I did my NaNoWriMo with this, but I actually started this story on July 12, 2012. Beyond the Waterfall was my original entry to the OC Writer’s Anthology (which is eventually coming out, I promise!). However, the story I wanted to tell refused to fit into the guidelines provided. In fact, it was my story that stretched them quite a bit. In the end, I decided to finish this story as it was and write an entirely different story in the space of a couple weeks. I always felt this was a stronger story, but at 9,000 words, it definitely wouldn’t fit under the 4,000 word limit. I also enjoyed pouring my own burgeoning issues with my interest in My Little Pony: Friendship is Magic into the main character. My second attempt at the OC Writer’s Anthology, it still ended up around 5,000 words, but managed to pass. This one happens six months before the events in Beyond the Waterfall, both of which are loosely tied with the Taylin world. I haven’t decided if they’re “canon” or not, but that’s a decision I can make some other time. But it’s another accomplishment, especially since I did both stories while working at another Apple Store. I also did one other short story this year that you don’t know about. And I have no intention of sharing. So ha! But it’s another one I can add to my list of accomplishments. This is what I worked on during summer, hoping to create a full novel out of this. I got about 1/3 of the way into the revision before my time was demanded elsewhere. The rest of July-August was spent working on “Glimmer” and another story I can’t quite remember trying to figure out which one to publish first. I worked endlessly on Glimmer to make it perfect. 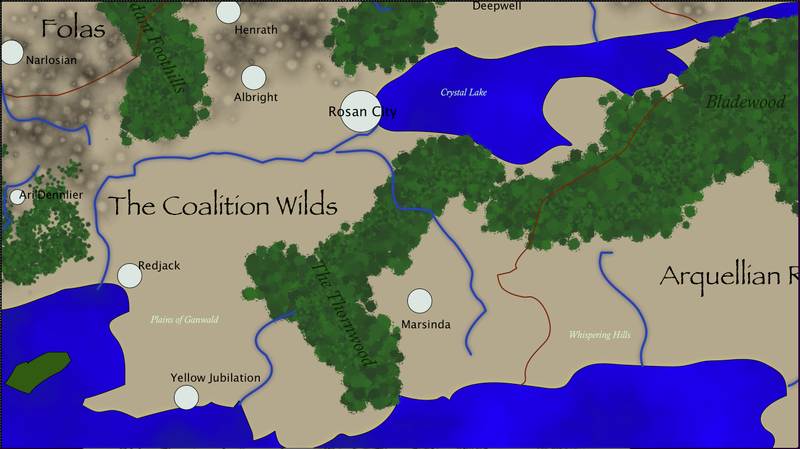 Taylin Map: I had did a map of the entire Taylin world, including places that shouldn’t be spoken about for years in book time. OC Writers: After getting some time away from work, I managed to start being able to attend the OC Writers Group every Thursday. This was a huge encouragement to me. The whole no-work thing also saved me in regards to National Novel Writing Month, giving me the time I needed to work on it. -rks Blog: I got serious about the -rks blog, as you can see, doing posts almost every week for a good portion of this year. Publish “Beyond the Waterfall”: This little guy is begging to be published, which is why I’m offering it up to the critique group as a guinea pig. There are plenty of other projects running around in the back of my mind, but right now, I want to focus on what’s achievable and doable. That’s important. Very important. And all four of those can be done before February, I think (except for maybe Magic and Steam…I’m not sure how long this one is going to be). There’s more to life than just writing. And this year, life has been interesting to say the least. We found out we were pregnant and were expecting on November 5, 2013! Of course, little Talissa didn’t wait that long and she arrived on October 31, 2013. Whoo! Caitlyn also turned 3 just a few weeks ago. Now that was an interesting event…a bit crazy, but fun nonetheless. However, tragedy hit when Laura’s grandmother passed away and we were forced to fly all the way to Michigan during…April? That was an adventure and a half. But in the end, Laura got to show me a large part of her family and Caitlyn’s grandfather on Laura’s side finally got to meet Caitlyn, which honestly…didn’t look like it was ever going to happen. And it went fairly well. Not only did I get my long-desired Genius promotion at my Apple Store shortly before the end of 2012, but I finally came into my own there too. I created a “Get To Know You” Project at work so everyone could actually learn about the other people on the team, which turned into a rousing success. And of course, during the middle of April, I decided to take Caitlyn home and watch the first episode of My Little Pony: Friendship is Magic. And all of you know what that led to. A radical change in my perspective and a whole new kind of obsession. Finally, we had the big one. The panic attacks that forced me to take time off of work and in combination with my Baby Bonding leave, I was gone from work from the middle of September and will continue to be gone until near the end of January. I’ve read a lot of books, played a lot of games, written a lot of words. You know, it’s common for me to look back at my life and think that I’m wasting it. But in truth, I would burn out if I really tried to write every minute of the day. If I didn’t take breaks for gaming and stuff…I would self-destruct. It would eventually kill me. It’s hard to remember sometimes. But when I write something like this…I realize that I have done a whole lot this year. Finally published, multiple stories on the way, networking with other authors, beaten games, introduced Laura to new authors and stories (Name of the Wind, anyone?) and so much more. It’s been a crazy year. I don’t expect my life to get any less crazy. But God willing, maybe it’ll get a bit more focused. And maybe you’ll be able to pick up one of my books off of a bookstore bookshelf this time next year. After looking at all I did this year…it doesn’t seem like such a long-shot after all. Now…what do put for New Year’s Eve PMV? The first thing that came to mind is something powerful…something energetic…something ascendant. But then I realized there’s another one that’s even more beautiful…and it works so well with my writing, that I can’t help but put it in. Because there’s still one wish that hasn’t come true. Ironically, it’s the whole point of that show I’m so obsessed with. I’m still lonely. And I still really need some true friends. And God, if I can have a real wish, I’d like some more friends this year. Real ones. It’s been one hell of a year guys. And I hope you stick around for 2014. It’s going to get interesting. That I can promise you. Until next time, good luck and have fun. The Real Life Strikes Back! Well, I don’t honestly have a lot to report this week. I’ve been inundated with real life stuff and have had very little time to write. And that’s been eating at me. A lot. I’ve spent a ton of time working on other parts though, including finishing my Taylin map (at least to some degree) and working with Aeon Timeline (part of the NaNoWriMo winner things) to come up with a good timeline for the Taylin world. It’s 15,000 years old, after all. Aeon Timeline isn’t the easiest program to be use. I’ll be honest, there’s a substantial learning curve. In truth, I think what I need it for isn’t really what it’s designed for. I remember trying it out for The Orion Project. And for the record, when trying to deal with multiple timelines having to do with temporal changes is something that the program just completely fails at. However, I doubt Time Travel stories is Aeon Timeline’s primary target. No, this week, I’ve been doing two things. First, I’ve been enjoying SKYRIM on the PC. Now, I played this on the Xbox 360 a bit and just couldn’t get into it. However, Skyrim on the computer is a different story. Why? MODS! I’m totally in love with the sheer amount of awesome detail Skyrim mods have. 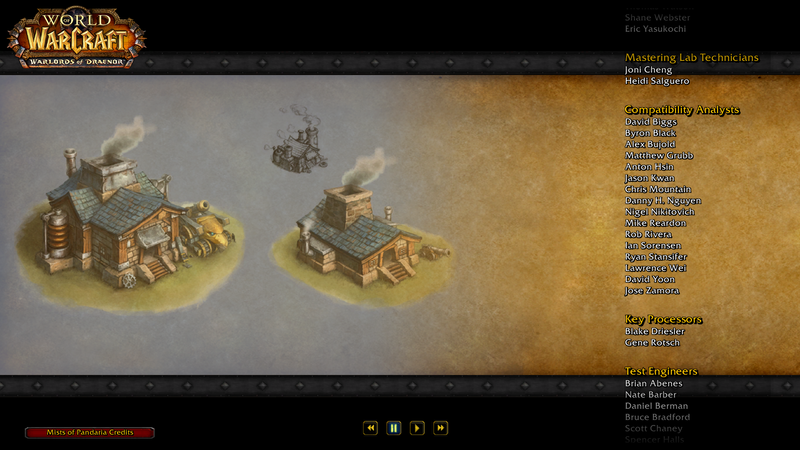 I can have a rebuilt airship as a home with every sort of crafting tool? Yes please. I can craft boxes and bags and bandoliers, not only for myself but for my companions? Oh HELL yes. And the companion system? Awesome…especially with more mods. Way too much fun. Seriously. So when I got my receiver, I didn’t want to go without speakers, so I just hooked up my existing JVC speakers and realized they sounded great. A lot better than they used to. After one night, I realized I didn’t need new speakers at all! I just needed some good re-wiring and a new sub. Now, I had my eye on a subwoofer on Black Friday/Cyber Monday. It was the Polk Audio PSW10 10-Inch Monitor Series Powered Subwoofer. I was pretty frustrated about the disappearance of the Yamaha speakers and I asked Amazon through their customer support for the pricing for the subwoofer (it was $69 for a unit that goes for about $240 normally. This sub was also the highest rated and best seller in it’s class on Amazon at present). They turned me down with a rather foolish tale about them not being able to honor “Lightning Deals” after the fact (it wasn’t a lightning deal, it was a Cyber Monday special). That day I find a great deal on a Yamaha subwoofer on Craigslist. Friendly guy, seems honest. Heck, his daughter had a birthday the same week mine did! So I make plans to get together with him in Brea on Monday. I contact Amazon, telling them that I’ve decided to go another route with all of this and I want a refund on the speakers that never came (they offered to overnight me a new set or just refund it). I wake up in the morning to a new email…offering to give me the Polk Audio sub for the price I wanted. So I contact the Craigslist guy, thank him and decide to go with the Amazon subwoofer and get next day shipping. And then I get a text from UPS saying that my Yamaha speaker set will arrive later the day. I get an email from Amazon telling me to refuse delivery and they’ll handle it. The next time I open my front door…a 5.1 Yamaha Speaker set is sitting on my porch. The good news of all of this chaos? I got the Polk Audio system today and set it up. The music is glorious. Seriously, listen to it. It’s freaking amazing. And my expression upon listening to it? I’m happy with it. I’m also just happy it’s done. Okay folks, I’ll be honest. I’m fading out here. I’m super tired. Been up too late with a combination of converting a bunch of my DVDs to digital format and playing too much Skyrim. Other things…other things…oh yeah. I had to get both the power steering pump and the power steering hose replaced on poor Kasumi, my 1999 Honda Accord. I also have only 1MM left on my brakes, my alignment is horrid and my two front tires are ready to totally go out. So I’ll be replacing my brakes on Friday and doing my tires on Saturday. I hate car stuff, especially since I just had my radiator redone a few months ago. This guy is freaking AMAZING.